A Gram Shiksha Sabha in action. 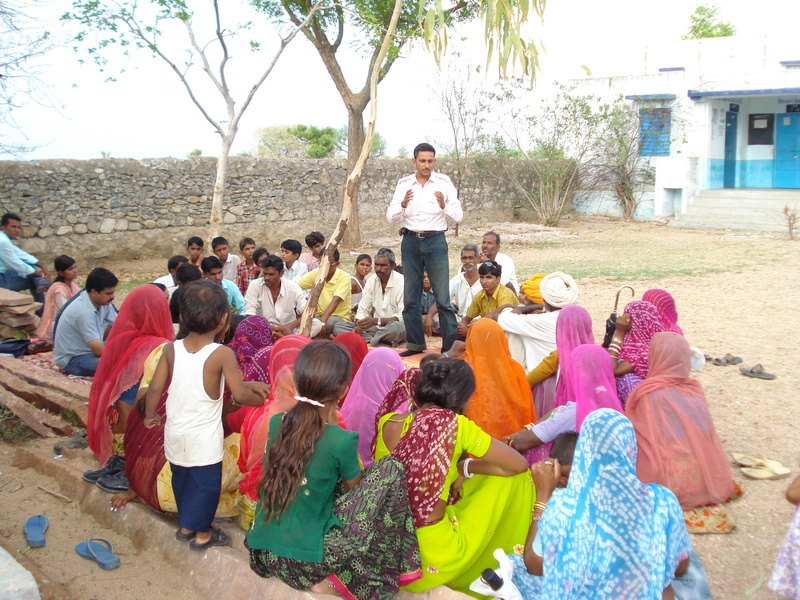 On Thursday, July 7, 2011 the villagers of Lalpura gathered for a Gram Shiksha Sabha (GSS) to discuss enrollment in the nearby schools. Educate Girls employees Malaram Meena, a Field Coordinator, and Deepmala Sharma, a Training Officer, led the meeting and discussed the challenges and benefits of enrolling girls in school. Many of the villagers had to leave their work to attend. A covered concrete area, the public area in the middle of the village, was crowded with everyone from grandparents to squealing toddlers piled in together, sitting barefoot on tarps and covered blankets. Malaram explained that the governmental Child Tracking System (CTS) listed 29 girls as not enrolled. Through his previous discussions with families in the village, he had found that 7 of those listed names were actually girls already enrolled, 8 were over the targeted age limit, and 2 were fake names. However, there were 4 girls he thought could be enrolled during the course of the meeting. After Malaram read the list of girls’ names, discussion broke out all at once, with parents explaining reasons for their daughters not being enrolled and other villagers pointing out mistakes in the list. Some explained that they needed the child’s help with housework, or they didn’t want their daughter walking the long distance to school. As the conversation progressed, Deepmala and Malaram told them that despite the challenges and struggles, especially economically, that many villagers face, overall it would be better for them if their girls were educated. They could afterward apply for government jobs, take better care of their future children and husbands, and eventually care for their elderly parents. And if any misfortune happened, they would be able to take care of themselves and not be at the mercy of others. As Deepmala and Malaram spoke, many mothers made little remarks showing they agree. Gradually people started to understand different perspectives, communication was able to happen and solutions began to be formed. The combined pressure of respected community leaders, trained Educate Girls staff, and a majority of villagers goes a long way towards putting girls back in school.